Almere is one of the five nominees to become best Cycling City of the Netherlands in 2014. Chosen from a long-list of 19 municipalities, these five municipalities compete to take over the title of current best cycling city ʼs-Hertogenbosch, which was elected in 2011. I will make a small portrait of all five nominees and in reversed alphabetical order Almere is the fifth and last after Eindhoven, Enschede, Velsen and Zwolle. Almere city centre. 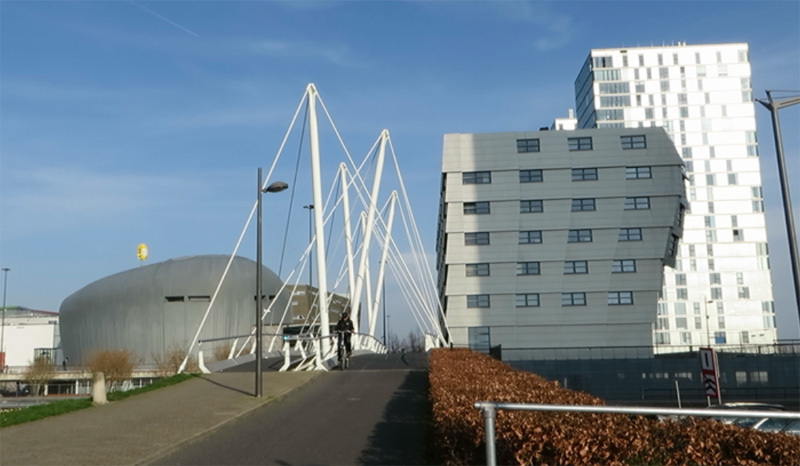 Cycle bridge and modern architecture. Almere is not your average Dutch city. That is how the city describes itself in the bid book for the Best Cycling City competition. And the residents seem to agree. 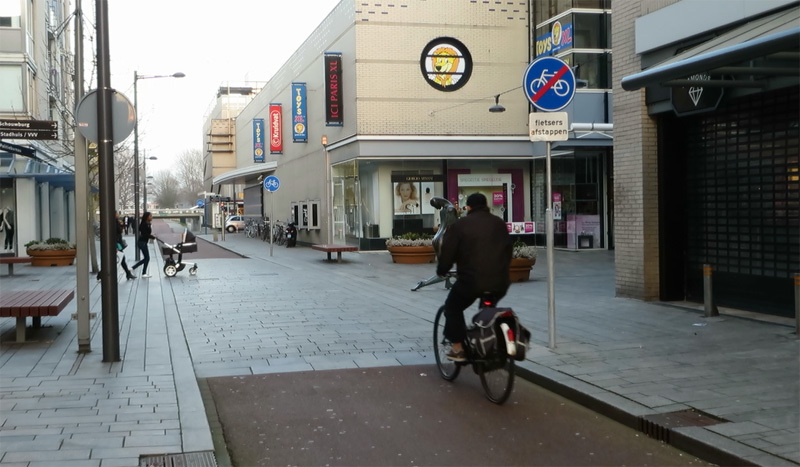 In 2010 an investigation showed that 80% of the people in Almere is (very) happy with the cycle friendliness of the city. But they are less satisfied with maintenance. Cycle path in Almere. It has priority but it is only 3 metres wide and at every side street the path has a big hump. In modern design the side streets would have the humps not the cycle path. Almere is a new city and the first residents have only lived here since 1976. The area where the city is now, a former seabed, was pumped dry in the 1960s. I have written about this in an earlier blog post. The former sea became the province of Flevoland. Almere was the second large city in the new province after the capital Lelystad. 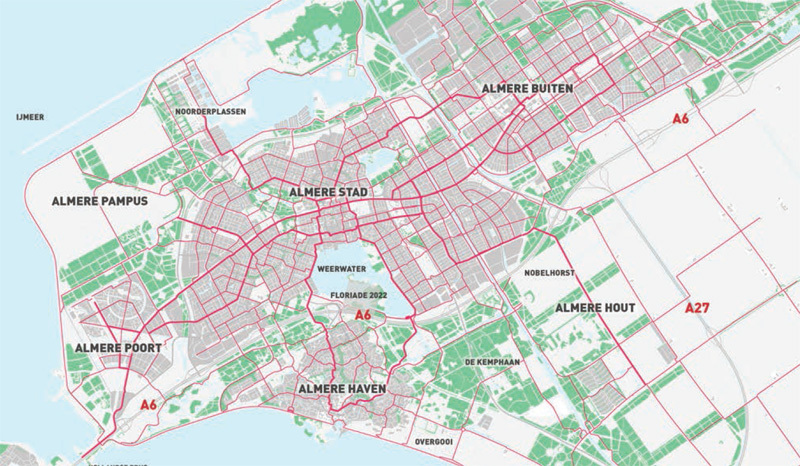 Designers wanted to create completely separate grids for the different types of transport in Almere too, but they did not want to make the same mistakes as in Lelystad. There all the cycle routes were elevated and all crossings were built as 5 metre high overpasses. That meant that cyclists had to cycle up steep inclines and with the fierce winds in the former seabed that was not an easy task. Slightly elevated roads and slightly lowered cycle paths. 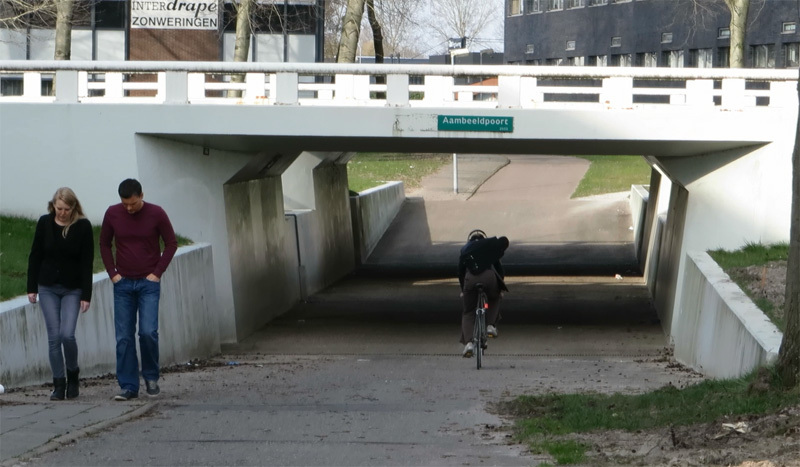 Almere has over a 120 of these under passes based on the example of Stevenage in the UK. Clearly visible is the poor state of maintenance. This is not a nice place to be after dark. So the designers went to the United Kingdom and looked how the cycle grid of Stevenage was built! They took their inspiration from that new town and perfected the system. 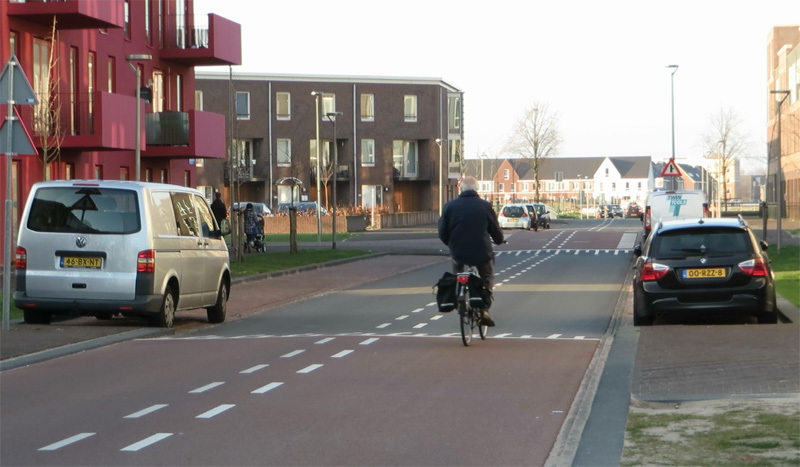 All major roads in Almere were elevated one and a half metres, so that all cycle tracks only had to be lowered with one and a half metres too, to provide the necessary clearance for the crossings without needing steep inclines. In tunnels you would be cycling protected from the winds. This is why Almere now has 120 bicycle underpasses. 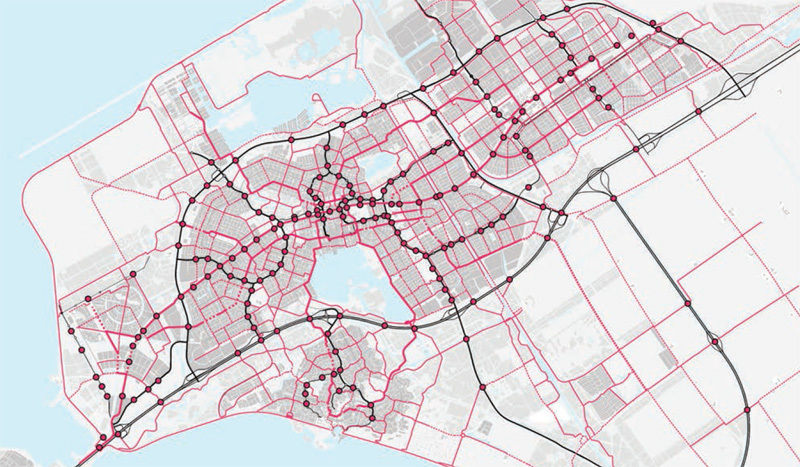 Almere’s cycle routes (red) and main car routes (black). Where the two meet underpasses were built. Every dot represents an underpass (or sometimes an overpass). But that didn’t mean new errors were completely prevented. In an effort to further shield people from the fierce winds in the totally flat and open former seabed, new streets in the first residential area of Almere (Almere-Haven meaning “Port”) were designed narrow and in a so-called “loops and lollipops” pattern. But that made the main cycle routes winding and unclear and it is very easy to get lost. In later areas of the city the streets were again constructed wider and less winding. The separate bus transit tracks were first designed to run at the back of houses, to get the ‘ugly buses’ out of sight. Until the designers realised that these buses carried many people looking out, who now got to know the city from its least appealing side. So areas that were yet again designed later got much nicer bus routes, lined with trees, at the front of buildings. These developments make clear the design of the subsequent parts of Almere is one of trial and error. The separated traffic grids have many advantages, but there are also disadvantages. The decreased feeling of social safety is the main drawback. Tunnels can be dark and the paths between the various parts of the city can be deserted at night. The extensive cycle network in Almere connects all the different parts of the city. 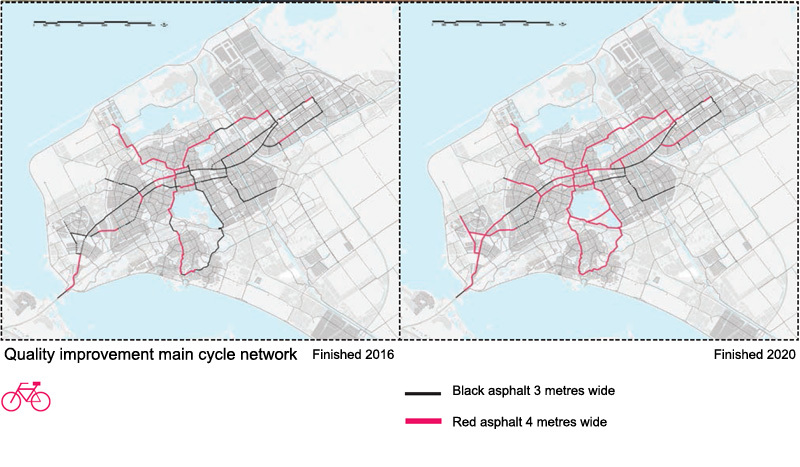 Despite the extensive bicycle network cycling in Almere remains 3% below the national average. The city thinks that may be caused by the competitive public transport, the relatively long distances to destinations, a relatively high number of commuters to out-of-town and the low number of students in particular. But maintenance conditions and the social safety issue could perhaps also be a reason. In the newest districts which were completed in the period 2008-2012, the separated grid system was less stringently applied. Intersections of routes with busy main roads are still not on the same level, but quieter routes for motor traffic can be crossed safely in roundabouts. The city more often chose for cycle routes in main residential streets and not as completely separate cycle routes. These routes were built as a cycle street (‘fietsstraat’) and they partly got red asphalt. Cycle streets cost less than separate routes and they have a higher level of social safety. A fietsstraat (bicycle street) in Almere. Not the best example of how to build a pinch point in a cycle street… it is a good thing that it looks temporary. That sounds good, but the reality is not so rosy. The roundabouts I encountered are fine, but the bicycle streets were sometimes disappointing. Partly because they are still under construction or clearly temporary, but also because the design allows cars to drive too fast. 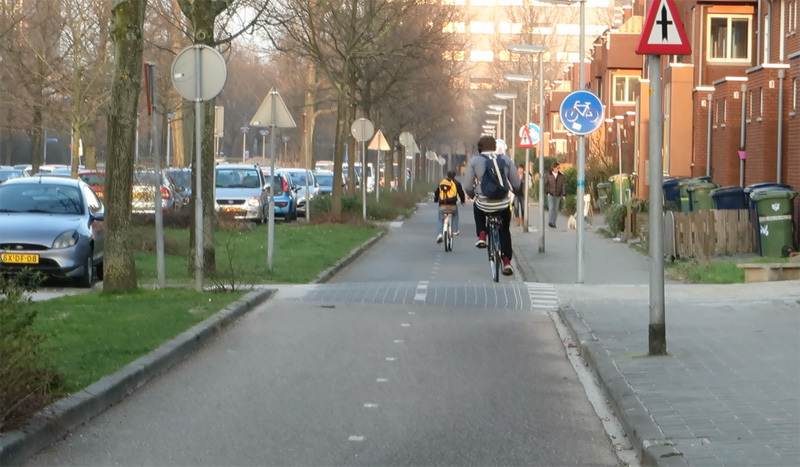 In older cities cycle streets are usually constructed where there is no room for separate cycle tracks. It seems odd to design such streets in a completely new part of the city. I think Almere should really review this policy. When children spontaneously shout out that they will continue their ride on the side-walk (as you can see in my video below), something is clearly wrong. Fietsstraat in Almere. Usually in cycle streets people cycling should outnumber motor traffic. But that is not the case here. In the video two little girls decide to cycle on the side-walk at the beginning of this street. There is more room for improvements. The width of most of the paths was fine for the 1980s, but nowadays 3 metres is generally considered too narrow for a main cycle route. Also, there seems to be a maintenance backlog; many surfaces are worn. Strange, because the city reports that €22.8 million was invested in cycling from 2008 to 2012. Yet many paths look like they are in urgent need of a new surface and some cycle tunnels really should get a makeover. The city has tried to remove as many posts as possible, but I still encountered more bollards than I would like to see. 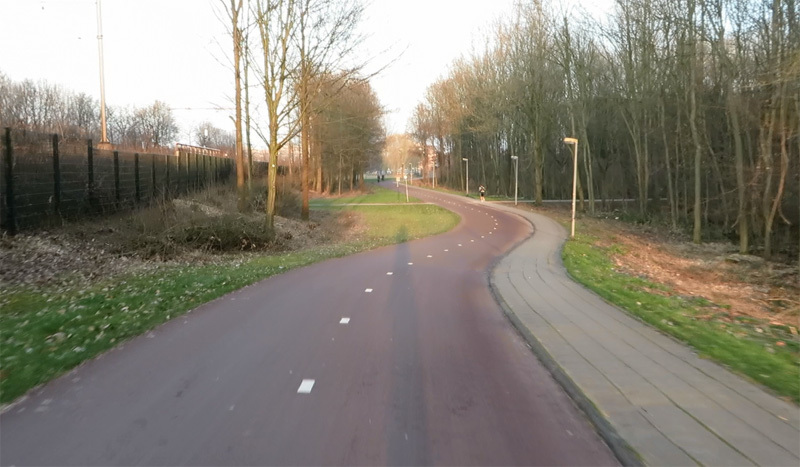 This cycle path in the centrally located city park in Almere has been updated to the latest Dutch design standards. From 3 to 4 metres wide and with a surface of smooth red asphalt. This is Spoorbaanpad that sees about 21,000 people cycling every day. The city has set aside even more money for an update of the cycling infrastructure: €29 million for the period 2013-2020. A number of paths will be widened from 3 meters to 4 meters and they will get a new surface of smooth red asphalt. Where that was already done, it looked really good. But 500 kilometres of cycle routes is a lot to maintain in one municipality, and it shows! This map shows that only a small part of the 500 kilometres of cycle routes in Almere will be updated until 2020. From the bid book to become best cycling city of the Netherlands. What I think is really unacceptable, was the sign I found in the city centre. “Cyclists dismount” where a major cycle route intersects a pedestrianized shopping street. That can never be a good solution for a traffic problem, not under any circumstances. A sign indicating the end of a cycle track with the sub sign “cyclists dismount”. Experts are not even sure if this is a demand or a request and whether it is legal at all in the Netherlands. Well, what ever it is, it is unacceptable! 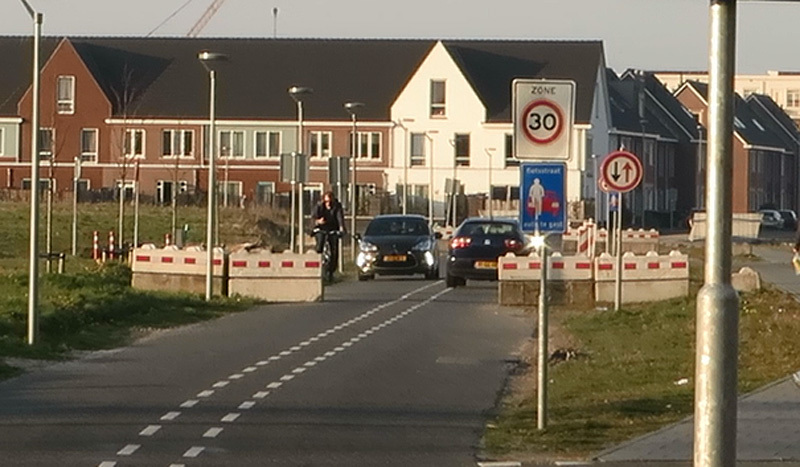 All in all, Almere is a great place for cycling, no big intersections and a great safety record, but it also has a number of issues that need (and to be fair, get) attention. The development from separated routes to poorly designed cycle streets seems a backward trend, that I found most disturbing. Surfaces and tunnels are in poor conditions and there is a social safety problem. I may set the standards very high here, but this is a competition of being the best of the best. And I personally think that the city still has a lot of to work to do on especially the maintenance backlog, before it can truly compete for this title. My video portrait of Almere. This was my final portrait of the five nominiees for this year’s Best Cycling City of the Netherlands election. The jury is also visiting all five cities and the winner is to be announced early May. I will of course make that winner known on this blog as well. A great series, Mark. I’ve really enjoyed them all. From an educational perspective these posts are as good if not better than visiting each city as the background you give about the urban planning aspects (historical and current) really adds a lot. Do I have a favourite to win? I’m torn between Zwolle (because it’s the only one I’ve visited and it was pretty good), Eindhoven and plucky little Velsen. I don’t envy the jury having to decide but I’m sure they’ll make a sound call. I’ve read all five posts about the entrant cities, and watched all five videos. Based on the information you’ve presented I agree with you that Almere isn’t the best. I like Almere for its “new town” urban planning. The three distinct “mode grids” are unique to the Netherlands, it seems, and town planning in general. It presents a good study case. How come the city was built with vast fields between districts? How come several of the new neighborhoods lack landscaping and street trees? The big spaces in between are there because the city was supposed to be bigger at first and it was to have multiple centers. It will grow further so many gaps may be filled in later. But the plans were changed over and over. That some streets are without trees or green has to do with what the Dutch perceive as central streets or residential sub-urb streets. We couldn’t have too much landscaping in the city center or we wouldn’t recognize it as the city center. That has to do with all our historic city centers and how they look, that shaped this national way of seeing things. The ironic thing here is that to me, an American, in a city center, I expect to see a grid of tree lined streets, which may well not be present in a suburb. Usually, it is the exact opposite! There are far fewer tree lined streets in US suburbs than in US cities, which ends up making the latter far more pleasant to walk on. I think you’re making an excellent point there, Steven. Almere is not known for the cosiness of its centre. It’s often been said that the city hasn’t got a real heart. Regrettably ideas of what architects want and what residents want often don’t agree. Of course a more green agreeable centre would add to creating livability. I often wonder if anyone has ever made a rating list in what people find attractive in urban surroundings… Seeing all this retrostyling of the last decade, it seems the best a lot of people can think of is go back to old and proven designs. In some other areas though, Almere is known for having lots of green everywhere. As it was put right on the old lake/sea bed, trees have grown huge there in just a few decades. I found this post very interesting – being a very young city, it’s interesting to consider the design decisions (and mistakes) in the context of Anglo cities & suburbs. Future improvements for Almere may seem more applicable abroad. This entry was posted on 20 March 2014 by Bicycle Dutch in Original posts and tagged Almere, Fietsstad.